Vasily Grossman, Life and Fate. Born in the Ukraine in 1905, Vasilly Grossman published his first novel 'Stepan Gluchkauf 'in 1933. Grossman was Jewish and his place of birth was one of the largest Jewish communities in Eastern Europe. Grossman is most notable for his work as a journalist during WWII and his eyewitness accounts of the fall of Stalingrad, the fall of Berlin and the Holocaust. He published the first account of a German death camp written by a journalist. He went on to publish a novel about Stalingrad in 1952 called "For a Just Cause" and in 1960 "Life and Fate". Vasily Grossman's book The Road was available from LibraryThing Early Reviewers. Vasily Grossman's book Everything Flows was available from LibraryThing Early Reviewers. 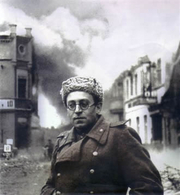 Vasily Grossman is currently considered a "single author." If one or more works are by a distinct, homonymous authors, go ahead and split the author. Vasily Grossman is composed of 39 names. You can examine and separate out names.